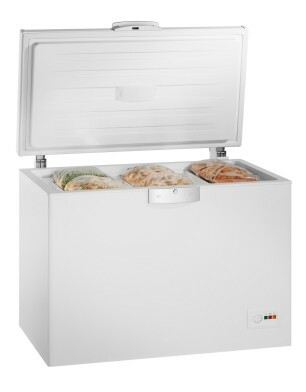 A chest freezer is a great way to store a lot of food, but it is easy for it to become disorganized. Storing frozen food only saves you money if you can find it when you need it. This is a guide for organizing your chest freezer. I must admit that I read these tips and I don't remember where. (It may have even been on this site!) The article I read suggested using small baskets for different categories of food. The categories were as follows: beef, chicken, pork, prepped foods, and prepared foods. I have a garden and don't consume that much meat so my categories combine beef and pork and add veggies. Prepped foods would include things like chopped peppers, onions, etc., prepared sauces such as marinara, or perhaps shelled nuts. Prepared foods would include casseroles ready for the oven, meatballs ready to cook, etc. This seems to work for me. I purchased my small plastic baskets for around $1.50 at the dollar store. Of course these are just suggestions. Each of us have different tastes and needs. However you choose organize it, the baskets seem to do the trick! I also have quart size canning jars for small packages of chopped nuts, ginger nubs, nutmeg, etc. This prevents the small packages from falling into cracks and getting lost. Gallon size resealable bags would also work great for these small items. When I freeze in plastic bags, I try to make them as flat as possible and place on a cutting board in the freezer. (Remove cutting board when packet is frozen.) The flatter the better for storing! I make a list of items that I store in my chest freezer, and keep in taped on the inside of a kitchen cabinet door. As I use the items, I cross the item off the list. As I add more to my chest freezer, I add the item to the list. I leave room under each sub-title for items that I need to add at a later date. Every 6 months or so, I'll re-do the list as it does get a bit messy looking. But, that's easy, I make the list on "Wordpad" on my computer and save it, so I can easily go back to delete items and add items. If you live in a cold climate, save even more freezer space at this time of year by simply putting things outside (in sealed containers, of course)! To organize my chest freezer, I use plastic grocery bags. I put like things in a bag and label it. It's easy to pick up the bags on top and move them to get to the things underneath. Out with our chest freezer I have an old chalk board, I have marked it down in sections: right side, middle, and left side for both top and bottom sections. One part is fruit, another meat, another frozen meals, etc. I just bought a Kenmore 5.0 freezer chest. It is the first one I have ever owned and I am just looking for tips. I want freeze as much as I can for reusing. I guess I should ask what not to freeze too? Mine is used to freeze meat and other things that are on sale. When frozen vegetables are on sale I buy a lot. When chicken is on sale I buy what I can and freeze them. The only thing that I can tell you is that air is bad when freezing. I add water to meats (wine with some, red for beef and white for foul) and get the air out before freezing. It was the best buy I have ever made. You can freeze bread loaves and milk too. Keep most recent foods on bottom of items purchased prior. Many leftover foods can be placed in your freezer; just keep them airtight. Wrapping with wax paper and then foil or freezer bags. I like to squeeze the food in gallon size bags flat because it takes up less space than well rounded filled bags. Thawing if faster also. When my freezer is only partially full, I add gallon milk jugs filled with water. The gallon jugs of ice help to keep the temperature of the freezer colder, thus using less electricity, plus they help keep everything frozen in the event of a power outage. HI, This is a good time of the year for filling a freezer. I am making soups to freeze for the cold months. blanch corn on the cob, remove from the cob and put in freezer containers, skin tomatoes and chop and freeze for recipes, zucchini bread or even frozen grated zucchini, bread form the bread store, one thing i like to do is to have a bag or container and put in all the little left over bits of veggies, when full, make a pot of veggie soup. Just about anything can be frozen, except those things that need to be served fresh and raw, such as cucumbers and lettuce. If you grow your own vegetables, you can freeze them for later use. If you do not, buy things from the farmers market or when they are on sale, repackage and refreeze. One can also buy meat from local farmers, have it packaged, and store that in your freezer. If that is not something that are able to do, certainly you can buy things in large packages, and repackage into smaller lots for your family, especially if you are only two or three. It is very important, for any freezing, to pack things in airtight packages and remove the extra air. I like to use ziplock freezer bags, as they are so easy, and I reuse these (wash and save), so I feel that the extra expense is worth it. I like to do soups and particularly juicy things like frozen raspberries in plastic containers. You can purchase these, or reuse cottage cheese, yoghurt containers, margarine, cool whip, anything like that. Fresh bread or baking can also be frozen -- purchased bread in its regular bag, homemade in a recycled bread bag. Cookies, tarts, and such can be put in bags or into larger plastic containers like ice cream pails. I also freeze individual portions of leftovers to take for school lunches. I use sandwich boxes for these. You can also make your own TV dinners if you are so inclined, to help save time during busy periods. If you put them in foil containers, they can be rewarmed in the oven. If you put these in plastic containers, they can be warmed in the microwave. Most fresh veggies need to be blanched before freezing, but most fruits can be frozen just with sugar (strawberries, raspberries). ive had a chest freezer for about 10yrs now and i find it pretty useful. i put what i use daily(peas, ice cream etc.) in the freezer compartment(which is small) of my refridgerator and the rest goes into my chest. i have backup supplies for everything so as soon as something is finished, i go to my chest and replenish from there. one tip i could give you is to purchase a couple of largish square or rectangle plastic baskets with a handle or side handles and fill those up with what u want to freeze. then instead of delving around your chest freezer all u have to do is lift out a basket and look inside to get what u want. any leftover spaces at the sides between the freezer wall and of the basket can be filled up with larger(ready boxed) stuff that u can easily see and get to. How do I keep my cube freezer organized? I bought plastic storage bins and organized one for meat, one for vegetables, one for fruit etc. That way you can lift the whole bin out of the freezer and get what you want out of it. I used larger ones and when you leave the lids on it they are stackable and don't take up as much room. I want my $$$ worth, so found just too much valuable space being wasted by using asst. boxes and fancy containers in my freezer. Plastic bags eventually became brittle from the cold and ripped at the wrong time. Nobody knew where the spilled contents went, so they just tossed it back onto the pile. Grr. Someone suggested using different color pillowcases for freezer foods. Stopped at the local thrift shop to pick up a variety of cheapie pillowcases, washed them thoroughly and tried it. It worked! No more brittle broken plastic bags, more room. Pillowcases can be moved around to fill in the chinks, are more sturdy, easy to clean, and most of all easily identified. Tan-breads; yellow-dairy; dk green-summer veggies; lt. green-winter veggies; purple-chicken; orange-pork; white-fish; red-beef; blue-boxed foods (onion rings, tater tots, etc. ); plaid-precooked meals; stripes-fruits & nuts; flowered-to be canned/sundry. Now even hubby & kids find anything we need-no excuses! The pillowcases hold less but are easier to lift out of the freezer for those with bad backs, easy to just grab and go/clean out, and no more cold hands! We keep a running contents loose leaf tab notebook nearby for easy reference. Hubby was fascinated by the freezer dividers at a store once, and whipped up some out of sealed pegboard for airflow. Fantastic! So much easier to find things now. Plus they stay where you put them. Ahhh. I have a large chest freezer. I have lots of frozen vegetables in quart plastic freezer containers. These tumble over frequently and get all mixed up. I have some baskets that slide on the uppermost part of the chest. The quart containers sit on the floor and stack up to the baskets. I need something that divides the rows. Any advice? I use plastic crates (like milk crates) to separate categories. I mostly keep meat in my chest freezer, so I have one for pork, one for chicken, one for seafood, and one for beef (and venison). I also have one basket that came with the freezer and one little shelf on which I put "miscellaneous" items. My parents have a huge commercial type chest freezer from the restaurant they used to own. It holds tons of meats and veggies, but keeping everything organized was a nightmare. They had several of those 12 oz. soda can crates from Pepsi and Coca Cola left from their restaurant just laying around. Since my parents buy a lot of their meats and veggies in bulk to save money, my mom invested in a vacuum food sealer. She labels the packages before adding the food and sealing them. Then she places the packages in those crates and stacks them in the bottom. She keeps each type of food in its own crate (pork in one, chicken in another, veggies in another, etc. ), but there may be two or three crates of each type of food.